Figure 1: An Oil Derrick that is placed on an Oil Well generates Drums of Crude Oil. Crude Oil is the root of the Polycraft petrochemical refining tree. It is typically distilled into Benzene-Toluene-Xylene (Vial, Beaker, or Drum), Gas Oil (Vial, Beaker, or Drum) and Naphtha (Vial, Beaker, or Drum). Other size vessels of Crude Oil include vials and beakers. Crude oil can be obtained by taking metal buckets, gathering oil from surface-generated pools of oil in the buckets and distilling them into beakers. 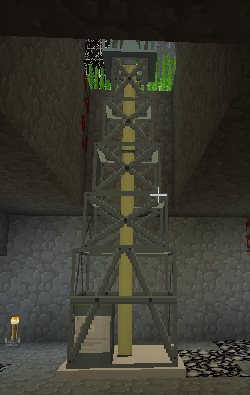 In more advanced stages of the game, Crude Oil can be generated by placing an Oil Derrick on an Oil Field Block which is bedrock that spawns on level 5 and exhibits a 90 degree rotation in its texture. This generates drums of crude oil. This page was last modified on 25 June 2016, at 04:53. This page has been accessed 8,630 times.